Where did “Rock-Paper-Scissors” originate? Well, Nature started it all. The first self-enforcing strategy that I investigated comes from the childhood game of Rock, Paper, Scissors, a world-wide game whose name varies from country to country. One of my favourites, from Japan, is “chief of the village-tiger-mother of the chief of the village.” Others include Janken and snake-frog-slug (Japan), elephant-human being-ant (Indonesia), Gawi-Bawi-Bo (Korea), Ching-chong-cha (South Africa) and morra cinese (Italy), while Canada has gone one better and added dynamite to the mix to make four possibilities. Whatever its name, children aren’t the only ones to play it. Adults have also been known to use it when they cannot agree or would rather leave a decision to chance. George Washington is reputed to have played it with Lord Cornwallis and the Comte de Rochambeau to decide who would be the last to leave Cornwallis’s tent after the signing of the British surrender at Yorktown in 1781 (the story goes that Rochambeau won, which is why the game is still called ro-sham-bo in some quarters). More recently, a Florida judge ordered two attorneys to play it when they could not agree on where to hold a deposition, even though their offices were just four floors apart in the same building! In the case of the attorneys, it needed an external authority to enforce the decision, but game theorists have discovered that the introduction of a third player totally changes the nature of the game. Now there is no need for an external authority, because there is an inbuilt balance between the strategies of the three participants, and no one strategy can dominate. Nature uses such a balance to maintain a diversity of species with different strategies for survival. Game theorists have shown that we can use a similar balance to limit the number of cheats in the Free Rider dilemma. Here I examine how the balance arises, and how we might be able to use it in practice. I started with the two-player game. Most of us know the simple rules. The players hold their right hands out simultaneously at an agreed signal to represent a rock (closed fist), a piece of paper (open palm) or a pair of scissors (first and second fingers held apart). If the two symbols are the same, it’s a draw. Otherwise rock blunts scissors, paper wraps rock, but scissors cut paper, so the respective winners for these three outcomes are rock, paper and scissors. It’s dead easy. 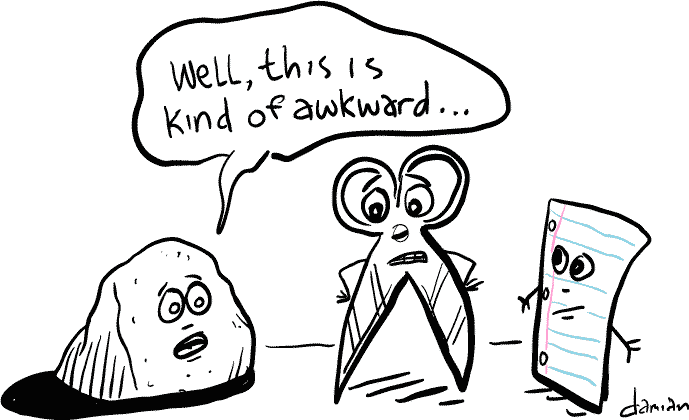 Rock, Paper, Scissors is a “zero-sum” game. If you count a win as +1 point, a loss as -1 point, and a draw as zero, for example, the sum of the wins, losses and draws for a game is always zero. To a game theorist this means just one thing – the optimum strategy can be worked out from the minimax principle. This leads to the intuitively obvious conclusion that the best approach, in the absence of any information about the opponent’s intentions, is to use a “mixed” strategy where you play rock, paper and scissors at random, with equal probability for each. When both players play in this way, they have an equal chance of winning, losing or ending up in a tied game. Maybe the girls had learned from that episode of The Simpsons where Bart thinks to himself “Good ol’ rock. Nuthin’ beats that!” which little sister Lisa of course predicts. In fact, Sotheby’s were unlucky, because they had chosen the statistically best strategy. Scissors tends to be played slightly less often in tournaments (29.6% of the time, compared to the statistical expectation of 33.3%), which means that it worth playing paper slightly more often. With that minor modification aside, complete randomization is the best option*. FOOTNOTE *The only problem with complete randomization is that it is difficult to achieve in practice, and most people end up following some sort of pattern which a good opponent may be able to predict. To overcome this, I worked out a way of randomizing strategies that no opponent could predict, because I could not predict it myself from one game to the next [it used random numbers]. When I tested my strategy against an on-line computer programme (see Appendix to this chapter) show, it proved to be remarkably successful. The Sotheby’s approach was perfectly reasonable, because they had no way of knowing what the Christies’ team was going to do. If they had, they could always have chosen a strategy to beat it. This no longer applies if a third player is introduced, as I discovered when I introduced the game to my 5-year-old grandson. His mother and I demonstrated the game to him, and he thought about it for a while before proudly announcing “I always play rock!” This made our strategy rather obvious, so long as just one of us was playing against him. But when the three of us tried playing simultaneously, something very peculiar happened. His preannouncement of a strategy meant that his mother and I could never beat each other without letting him win against one or the other of us. If I played paper, for example, she could beat me by playing scissors, but only at the expense of losing to his rock. This balanced tension between the three possible outcomes arose because of what mathematicians would call the intransitive nature of Rock, Paper, Scissors; in other words, the fact that rock beats scissors, and scissors beats paper, does not imply that rock beats paper. Instead, the three strategies are locked in an endless circle because paper beats rock. A similar balance between intransitive strategies is used in nature to produce a balance between species that use different reproductive strategies. The Californian side-blotched lizard provides one interesting example. There are three types of male lizard, with orange throats, yellow throats or blue throats. Those with orange throats adopt an aggressive, ultra-dominant strategy, and defend large territories with many females. Those with yellow throats can beat this by adopting a sneaky strategy in which they can get to mate with some of the females in the orange-throated male’s harem when the male isn’t looking. The strategy of the yellow-throats, though, is beaten by blue-throated males that keep small harems which they guard jealously to keep strangers out. But the blue-throated males are beaten in turn by the aggression of those with orange throats, in a beautiful symmetry of strategies that is identical to the symmetry of the strategies in rock-paper-scissors. It wouldn’t do any of the three types any good to give up their own strategy and use one of the others. If the orange throats, for example, switched to the sneaky strategy of the yellows, they could never beat the blues, who would soon become dominant. Nor could the orange throats switch to the blue strategy, because this would simply mean that the yellows could themselves switch to the ultra-aggressive orange strategy and quickly become dominant. All three are doing the best that they can, given the strategies of the other two. Evolution, in other words, has produced an optimum, balanced set of best responses for each type of lizard in response to the best strategies of the other two types, and the net result that the population of each male type varies over time around an average of one-third of the total, which is the best that any of them can do. The natural balance produced by the Rock, Paper, Scissors scenario is not confined to lizards. Researchers from Stanford and Yale have discovered that the same scenario is responsible for preserving biodiversity in bacterial neighbourhoods. The bacteria concerned are Escherichia coli – the type that are found in all of our digestive systems. The researchers mixed three natural populations together on the surface of a Petri dish. One population produced a natural antibiotic called colicin, but were themselves immune to its effects, as snakes are immune to poisoning by their own venom. A second population was sensitive to the colicin, but could grow faster than the third population, which was resistant to colicin. The net result was that each established its own “territory” on the surface of the Petri dish. The colicin producers could kill off any nearby bacteria that were sensitive to the colicin, and the colicin-sensitive bacteria could use their faster growth rate to displace the colicin-resistant bacteria, but the resistant bacteria could in turn use their immunity to displace the colicin producers! This type of self-enforcing balance between several different strategies has been shown to be an important component of biodiversity. If just one species is lost, together with the strategy that it uses to survive, the balance of strategies with the others is also lost, to the detriment of all except one. If orange-throated side-blotched lizards suddenly disappeared, for example, the yellows would soon follow, since their “sneaky” strategy is beaten by the blues “ultra-defensive” strategy. Only the blues would remain. The same damaging process happens in plant communities – when one species is lost, others can soon follow. The Rock, Paper, Scissors scenario, where each strategy is the best response to the other two, maintains the balance.